WASHINGTON (CNS) — Polish-Americans, including Cornell University senior Adrian Poniatowski, filled the Chapel of Our Lady of Czestochowa to honor the Catholic Church’s first Polish pontiff, who encouraged people throughout the world to be active members of the church. Poniatowski said Blessed John Paul II, the founder of World Youth Day, helped make Christ and the Catholic Church seen to the rest of the world. 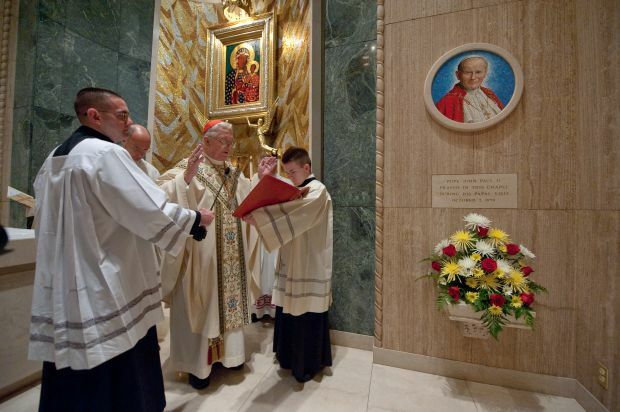 The dedication of the mosaic of the Blessed John Paul II was held Oct. 20 inside the Chapel of Our Lady of Czestochowa at the Basilica of the National Shrine of the Immaculate Conception in Washington. Cardinal Adam J. Maida, retired archbishop of Detroit, celebrated Mass in the chapel. 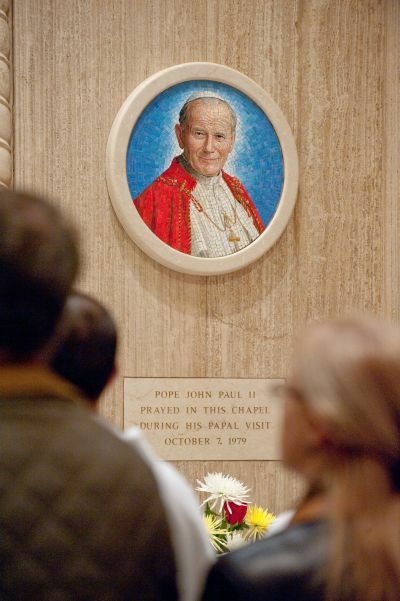 Blessed John Paul, who will be canonized April 27, visited the national shrine several times when he was Cardinal Karol Wojtyla of Krakow, Poland, and once as pope in 1979, according to the shrine’s rector, Msgr. Walter Rossi. Msgr. Rossi welcomed the congregation in English and Polish before the mosaic was unveiled. “Niech bedzie pochwalony Jezus Chrystus!” he exclaimed. Msgr. Rossi said the Blessed John Paul mosaic was presented to the national shrine as a gift of the Polish-American bishops and the National Polish Apostolate Committee. The plaque will read “St. John Paul II” after the canonization. Cardinal Maida, himself Polish-American, described the mosaic’s tiles as being representative of the different cultures and nations that make up the Catholic Church and lend to its diversity, as well as being a reflection of the ministry of Blessed John Paul. Cardinal Maida said each piece of the mosaic is part of a body rather than a puzzle. He related the mosaic as a whole to the church as the living body of Jesus Christ. He said part of the message Blessed John Paul proclaimed through his work and deeds is that every life is to be respected and treasured. “Every piece, every person, is beautiful and here for a reason,” the cardinal said. He also reflected on the pope’s painful experiences, such as being shot in St. Peter’s Square and his suffering from Parkinson’s disease as an embodiment of the wounded heart and merciful love of Jesus Christ. His parents conversed with Blessed John Paul in Polish. He said the pope kissed him and his three brothers. Poniatowski, who attended Blessed John Paul’s funeral one year later, said there was holiness emanating from the pope during the few moments his family spent in the room him. “I kept repeating the phrase in Polish, ‘We love you, Holy Father,'” he said.